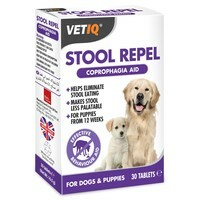 VetIQ Stool Repel Tablets for Dogs and Puppies help deter your dog from eating their own stools. It is suitable for both puppies and dogs and comes in a palatable chicken liver flavour. Active ingredients: Oleoresin Capsicum: A chemical compound that irritates the eyes to cause tears and mild pain. The active chemical called capsaicin causes a burning sensation and inflammation of the mucous membranes. This is the active ingredient that helps to repel the animal from eating its own faecal waste. Alpha-Amylase: An enzyme that breaks down the proteins, improving the animal's digestive performance. This should make the animals' waste matter less attractive to eat. 30 tablets. Unfortunately this didn't work for my dogs, although I must admit they didn't have the full packet each as it was shared between them. If anything, it attracted the main culprit to eat more of the others' faeces! This product is fantastic. Well worth trying.My dog not only stopped her habit but also became clean at nights! One pack and problem solved.highly recommended. This product does not work at all, and as yet have not found anything that does, don't waste your money! This didn't work for my dogs. What is making a difference is a herbal digestion supplement to aid absorption of food in the gut.